Giovanni Tedesco is set to take up a prominent coaching role at Palermo after being approached by the Serie A club to become Guillermo Barros Schelotto’s right-hand man. As Schelotto, who replaced Davide Ballardini earlier this month, has yet to obtain a licence to act as first-team coach on matchdays, Palermo president Maurizio Zamparini has turned his attentions to Tedesco who has the necessary qualifications after completing his UEFA Pro course during his time in charge of Floriana. According to reports, Zamparini wants the former Birkirkara coach to work closely with Schelotto during the week as well as lead the team from the bench during games. Contacted by Times of Malta yesterday afternoon, Tedesco confirmed that he had been approached by Palermo to join their first-team coaching staff. A native of Palermo, Tedesco spent the last four years of his playing career with the Sicilian club where he is still held in high esteem. 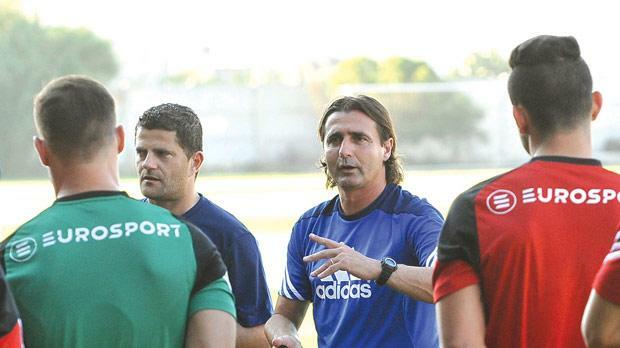 After a positive spell with Floriana, Tedesco took over from Paul Zammit as coach of Birkirkara last summer. In the early weeks of his tenure at the helm of Birkirkara, Tedesco oversaw a string of eye-catching performances as the Stripes advanced to the second qualifying round of the Europa League where they lost to West Ham on penalties after a 1-1 aggregate draw. However, Birkirkara decided to relieve Tedesco of his duties last month in the wake of a 4-0 league defeat to rivals Valletta. Last week, Tedesco was linked with Akragas following the resignation of Nicola Legrottaglie but the Lega Pro club, who have Malta international Zach Muscat on their books, handed the coaching job to Pino Rigoli. Meanwhile, Luis Oliveira, who succeeded Tedesco at Floriana last summer, has reportedly been sounded out by Como to become their new coach but has resisted their overtures so far. Sources told Times of Malta that Como had shown strong interest in Oliveira, who had a short spell with the Serie B club during his playing career, but the former Belgium international wants to complete his job at Floriana. The Greens, who have improved by leaps and bounds over the past two seasons, are in talks with Trapani over the permanent transfer of Igor Coronado. The 23-year-old joined the Sicilian club on a season-long loan last summer after impressing coach Serse Cosmi during a trial and has since established himself as one of the most exciting playmakers in the Serie B. It has emerged that Floriana president Riccardo Gaucci met Trapani officials in Milan last week to discuss Coronado’s future. Trapani are eager to acquire Coronado outright amid reports that a host of Serie A clubs, including Torino and Chievo, have set their sights on the Brazilian. Elsewhere, Valletta have concluded discussions to extend the contracts of most of their foreign players. Italian midfielder Claudio Pani has signed a new deal that will keep him at the club until 2018 while Jhonnattann has extended his two-year contract by another year. Valletta have also decided to make Henry Bonello’s loan move from Sliema Wanderers a permanent one with the towering goalkeeper set to sign a new five-year deal. Speaking to Times of Malta yesterday, Victor Sciriha, the Valletta president, said the Premier League leaders are not looking to make further signings during the current transfer window. Valletta have added two players to their squad, veteran striker Michael Mifsud and Brazilian defender Diego Balbinot. Sliema Wanderers are looking to strengthen their attacking options in view of Mifsud’s move to Valletta and Aidan Friggieri’s potential switch to Como. The Blues have been given permission by Hibs to speak to striker Jean Paul Farrugia but they have reportedly pulled out of talks to sign Brazilian forward Denni. As for Hibs, they are still striving to recruit a goalkeeper. Birkirkara’s Justin Haber has been repeatedly linked with a move to the Paolites who have also made enquiries about Malta no.1 Andrew Hogg, currently with Greek club Kalloni.